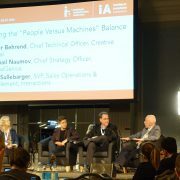 With all the talk revolving around the convergence of Artificial Intelligence, the present and future implementations of Intelligent Agents, Robotics, identity and biometrics, quantum, nano bio tech, and 3d printing, the Intelligent Assistants Conference held in London on the 26th and 27th of April left participants debating where we all stand in tech matters. Is it too soon to talk about the 4th Industrial Revolution just yet? Whether we want to believe it or not, businesses today are left to navigate the chasm in an ever changing digital world. Digital and biological worlds tend to get closer with every passing year and static businesses and websites seem to be coming alive through the implementation of Intelligent Assistance. As the Channel Owner of Swedbank, Martin Kedback, stated, in our present day, people are engaging with companies like never before. Users seem to now be logging into banking services through mobile devices 21.4 times per month on average. This data calls for a re-design of the way businesses interact with their customers. There is a strong demand for new channels of interaction that has not yet been fully addressed effectively. There is a need to hyper personalize customer experience and deliver it to the users in a quick, trustworthy and efficient way. We live in a world where the very use of our technology will be moulded by a level of hyper personalisation that can only be achieved through Intelligent Assistance. We now live in a place where the instant access and sharing of information can determine the success or failure of an enterprise. Virtual Assistants will be playing a key role in this personal information economy. These implementations will not only have to be proficient at managing knowledge, but will also have to guarantee an increasing degree of trust, security, and satisfaction. As silos of information everywhere are opening up to create a wider and faster world, there is a need to establish ways to effectively respond to the task at hand. The new “quick and cheap” chatbot trend seems to be providing a solution that does not guarantee any sort of satisfaction and security in the long run. 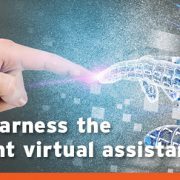 These unstable solutions and a sharp 57% increase in the number of IA companies trying to enter the market today seem to be calling for the establishment of “best practice” in terms of virtual assistance. The need to respect norms of human behaviour such as permission, respect, mutual value, and trust, must be met with efficiency and security by virtual agents. 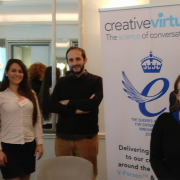 During the first day of IAC London 2016, the team members attending from Creative Virtual really felt the need to address two questions: Where do we stand, and where are we going as a global company? As our Founder and CEO, Chris Ezekiel stated, our expertise in knowledge management, agility, compatibility, technology, and the wealth of having an experienced team with an open mind, will push Creative Virtual to stay at the very top of this evolutionary wave. 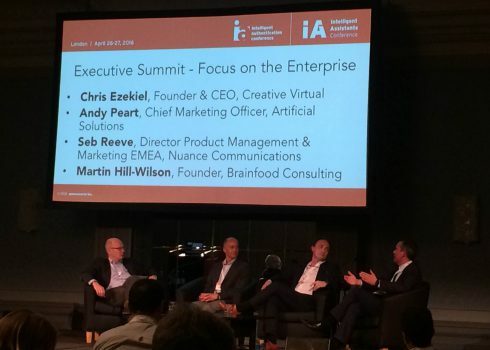 With regards to the future, during the Executive Summit panel, Chris pushed forth the idea that “we see the personal and commercial assistants converging in the future”. It is this mentality that makes Creative Virtual a leader in the field of Virtual Assistance. Be sure to follow Creative Virtual on Twitter for more from Day 2 of IAC London 2016. Not able to attend the event but want to know more about our innovative virtual agent technology? Contact us to learn more! 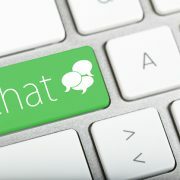 I Have Live Chat. Why Do I Need an IVA?